for a star with the accretion rate of . Entropy inversion is unstable for the convection (see 2.7 in p. ). Convection is generated in the region of . Convective motion transfers the energy and the entropy. The specific entropy peak generated by the Deuterium burning is smoothed out by the convection. The convection induced with the Deuterium burning brings a fresh gas containing Deuterium into the hot Deuterium burning region. Thus, although the consent of Deuterium is small and Deuterium burning could not continue long, Deuterium burning continues actually as long as the convection can mix the outer Deuterium rich fresh gas into the burning region due to the convection. 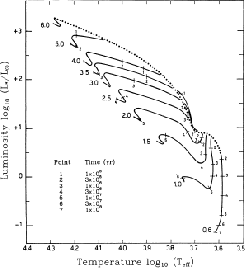 Figure: Luminosities in protostars accreting at (left) and (right) (Palla & Staler 1993). Accretion luminosity , Deuterium burning luminosity , maximum radiatively transferable luminosity and luminosity at the surface are plotted. is larger than for low mass stars ( for and for ). Excess energy is transferred by the convection, . 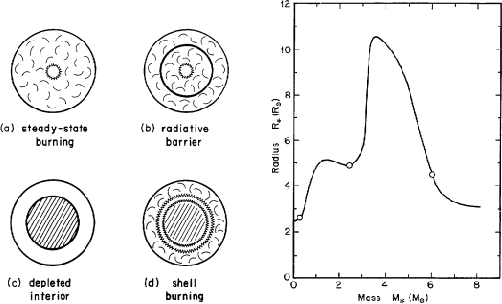 This figure also shows that except for extremely low-mass object the accretion luminosity is the major energy source over Deuterium burning . Since massive objects with satisfies , interior of such stars are fully radiative (energy is transferred by the radiation). for and for . Figure 4.20 (left) illustrates how the Deuterium burning in protostars evolves. Accumulating infalling gas and increasing , the structure of protostars is changed. (a) in low-mass stars, convection feeds the Deuterium of the accreting matter to the burning center. (b) as increasing the mass and thus the temperature, the opacity of the stellar interior decreases. Finally a radiative zone appears and it prevents from mixing Deuterium. (c) as a consequence, central Deuterium is depleted and energy generation rate is reduced. Thus the central region becomes radiative. (d) For higher mass stars, Deuterium ignites as a shell source just outside the radiative central region. Due to this Deuterium shell burning, which is similar to the Hydrogen shell burning in the red giants, radius of the protostar expands. Figure 4.20 (right) plots the mass-radius relation of a protostar with accretion rate of . The left open circle represents the beginning of central Deuterium burning (state a). On the second circle, radiative barrier appears (state b) and Deuterium shell burning begins. Beyond the mass, the radius swells dramatically. Further increase in the mass increases the gravity and the radius shrinks. At the third open circle, Hydrogen begins to burn at the center of the protostar. In the HR diagram, the mass-radius relation for the protostars shown in Figure 4.20(right) corresponds to the dotted line (Fig.4.21). Observed premain-sequence stars: T Tauri stars ( ) and Herbig Ae/Be stars ( ) distribute below the dotted line. Thus, this line is often called the birth line for stars. In Figure 4.21, evolutionary tracks without mass accretion are plotted from the birth line. Modulation of the birth line is related to the swell and shrink of radius shown in Figure 4.20. That is, increase of luminosity around corresponds to the first swell after Deuterium burning begins (between the first and second open circles). Another increase around is related to the Deuterium shell burning (after the second open circle). Figure 4.20: Schematic view of Deuterium burning in protostars (left). Evolution of the radius of a protostar is plotted against its mass (right). Both figures are taken from Palla & Stahler (1990). Figure 4.21: Premain-sequence evolutionary path in the H-R diagram. (Palla & Staler 1993). Evolution of stars with different masses from to are calculated from the birth line (dotted line).